After our visit at Caterpillar’s plant in Decatur, we traveled for another hour to Highland, Illinois visiting The Korte Company, a nationwide design-build construction company with two satellite offices in St. Louis and Las Vegas. This tour combined an office visit at Korte’s headquarter in Highland, Illinois and a short site visit at one of their current projects at Anderson Hospital in Maryville, Illinois. We were welcomed by Brent Korte, the Vice President of The Korte Company, in their office in Highland; he provided us with a brief history and depiction of The Korte Company. In 1958, Ralph Korte, a dairy farmer in Highland, decided to start his own construction company building dairy farm facilities in the area. Within the next few decades, the company expanded across the country and has since then worked in projects across 42 states. 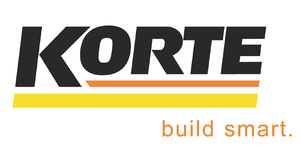 Today The Korte Company is a 100% employee owned company with $150 million in revues in 2012. Korte’s main focus is in design-build construction – a method to deliver a project in which the design and construction services are contracted by a single entity known as the design-builder; approximately 80% of Korte’s revenue comes from this sector. On the other hand, the company still does construction management, design services, and general contracting in parts of the country. Korte has also been working with some of the largest companies and governmental agencies in the United States including HITACI, the Army Corps of Engineers, Universal Studio, NASA, Boeing, Walgreens, and the United States Postal Services. The Korte Company worked closely with Walgreens and USPS on multiple projects on their processing and distribution centers, providing efficient building design to allow these companies to effectively manage their distribution centers across the United States. On the other hand, the company also has many LEED certified designers focusing on sustainable design. The company has worked on multiple LEED certified, silver, and gold projects across the country. On of the most interesting things we learned on this visit is how The Korte Company maintains a strong relationship with their clients. Clients such as the USPS and Anderson Hospital have worked closely with the company for a long duration on multiple multi-million dollar projects. Korte maintains these relationships by providing services that often exceed client’s expectations and treats clients with honesty and respect. 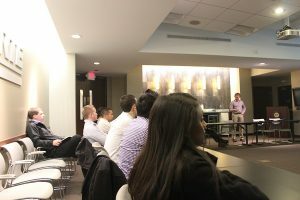 We were also fortunate enough to be able to meet with The Korte Company’s CEO, Todd Korte, and COO, Jason Mantle to share their outlook of the construction industry and The Korte Company’s direction in the next couple years. 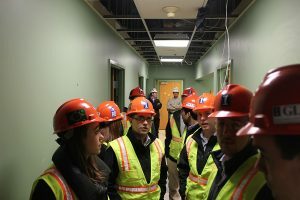 We quickly visited the Korte Company’s project at Anderson Hospital afterwards. 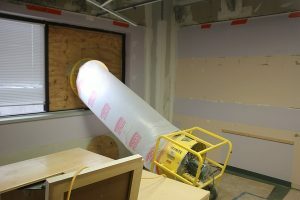 The project is to construction an additional floor on top of the existing three-floor building while it continues to operate. We were able to see the additional truss beam they placed on the first floor to provide additional support for the 4th floor and learn different challenges project team have faced, such as noise and air quality control. The visit was memorable and we had the opportunity to learn so much about design build construction, it was a great way to end the first day of our spring break trip visit.